A time of growth, change and achievement was commemorated at Emory's 172nd Commencement, which featured a keynote address by former U.S. Poet Laureate Natasha Trethewey. Take a look back with our special story package of photos, audio and video from the ceremony. 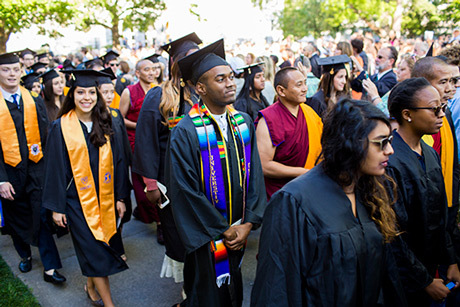 View scenes from Emory's 172nd Commencement as the university honored the achievements of this year's 4,615 graduates. Members of the Class of 2017 receiving bachelor's degrees were honored in the annual Baccalaureate service on the morning of Friday, May 5, in Cannon Chapel. Undergraduates in the Class of 2017 gathered May 4 for the Candlelight Crossover, a treasured Emory tradition marking their transition from students to alumni. Oxford College, located on Emory's original campus in Oxford, Georgia, held its Baccalaureate service on Friday, May 5, in Old Church, followed by Commencement on Saturday, May 6, on the Oxford quadrangle. Science, the arts and social justice formed the foundation of a remarkable four years for Caroline Holmes, who graduates with highest honors in physics and biology and is this year's winner of the McMullan Award, a $25,000 prize. A passion for human rights work led Emory senior Kaitlyn Posa to coordinate a panel discussion on religious persecution, which has now sparked an annual speaker's series. An MBA candidate at Goizueta Business School, Jared Greenbaum used his particular combination of skills and experience to facilitate a transformative moment for student governance at Emory. As class orator for Emory College, Noah Cole will discuss the need for students to hold true to the principles and advocacy they learned at Emory as they make their way in the world. After researching media portrayals of black and white women for her honors thesis, Emory College Class of 2017 graduate Glory James is headed to law school. Born in conflict-torn Sudan, Lurit Bepo moved to the U.S. at age six. As an Emory medical student, she returned to the country to view the hardships faced by the state-run hospital, fueling her interest in health disparities. Kevin Currie's commitment to protecting the health and dignity of vulnerable populations shines through his work with the Veterans Affairs Nursing Academic Partnership and Emory programs dedicated to fostering diversity and leadership in the profession. Having seen the destructiveness of addiction as a minister and in her own family, Katie Givens Kime focused her PhD research at the intersection of two of Emory's strengths: human health and religion. As Muhammad Naveed heads to Emory's Atlanta campus to complete his degree, he brings a record of leadership as president of Oxford's Student Government Association. A member of Emory's varsity cross country and track and field teams, Casey Rhode served as CEO of the Emory Impact Investing Group, a student organization that provides loans to entrepreneurs in economically disadvantaged areas. Marcus Sandifer, chosen by his peers as the "Most Outstanding" graduating JD student for the Class of 2017, attributes his success to his family, his professors and his desire always to do better for himself and others. Visiting her parents in Nepal when a massive earthquake struck, Iju Shakya immediately sought ways to help. After working with Atlanta's Bangladeshi community, she hopes to do community-driven public health work in South Asia. Master of divinity student Ruth Ubaldo follows her faith to Texas, where she will direct a church community center created specifically by a mostly white congregation to build relationships with the Latino neighborhood next door. In the classroom and through her work directing the Fox Center for Humanistic Inquiry, Emory English professor Martine Brownley has changed lives through her mentorship. With joint appointments in Rollins School of Public Health, the School of Medicine and Emory College, Carol Hogue brings an interdisciplinary approach to improving the health of women and children. Carol Anderson was already an award-winning historian and teacher when she saw Ferguson burning. The incident sparked her book "White Rage: The Unspoken Truth of Our Racial Divide," winner of the National Book Critics Circle Award for criticism.